The tea is sweet. The warm slurps melt down my throat providing much needed warmth inside. Vikram and Awnish are lost in their own thoughts. I am thinking about nothing…perhaps only about how perfect Nyima Ram’s tea is. I am sitting at my friend, Nyima Ram’s tea shop at Koksar, Lahaul. A few days earlier Awnish, Vikram and I had set out to reach Darcha from Koksar, trekking across the Tempo La in the heart of the Mulkila group of peaks also called the CB (ChandraBhaga) group. These are the peaks that take the breath away from your lungs as you stand on top of Rohtang and look north. Sheer jagged peaks with white caps and glaciers trapped among the peaks. I had always been fascinated with this incredible profusion of peaks and longed to delve into their sacred midst.elevations, hours of walking, grades of treks, itineraries, notes – I am always oblivious of these. I don’t trek in the Himalayas to measure anything at all. I walk because I am compelled to return to where I belong. I walk one step at a time. My feet do not carry me, it is my mind I trek on. We managed to penetrate to the heart of this incredible mountain complex but had to retreat at the sight of the heavily crevassed glaciers pouring down from the 5000 m high Tempo La. That, anyway is a different story but it provides the backdrop to what each of us were musing about while slurping Nyima Ram’s tea. “I dont want to go back over Rohtang”. I heard my thoughts echoed in space. I looked around and saw Vikram looking expectantly at me. We all had the same thought. We didnt want our adventure to end already and we certainly didnt want to get on a bus and leave for Manali. “Nyima jee, yahan se Dashaur ka raastaa hai?”,(Is there a road to Dashaur?) I asked. I knew Dashaur was a sacred and mystical lake somewhere to the east of Rohtang jot and was supposed to be incredibly beautiful. But i had only heard of people climbing to it from Marhi, on the other side of the Pir Panjals. I was sitting in Koksar at the base on the other end. “Haan jee, ek din ka raasta hai!”. I ask Nyima for the details of the route but he can only provide me a general direction and says we shud be able to reach it by evening if we cross the glacier alright. We set off early next morning after Vikram had successfully managed to choke the sewage system of koksar for the next 6 months with a truckload of toilet paper.We climbed the almost vertical mountain behind Koksar. There was no path, not even a hint of a trail. we just traversed up the steep incline as best as we could and within a couple of hours, commanded an eagle’s view of Koksar and the Chandra valley for miles on both sides. The Chandra was almost a fluoroscent green and had a gleam about its glacial waters that looked quite surreal.It meandered swiftly through the deep valley between the Pir Panjal to the south and the CB peaks to the north. We reached a broad meadow at the top of the climb and gaped at the waterfall which exploded water horizontally like a water canon. I went ahead to investigate the path and was accosted by an incredible view. The nala had narrowed into a gushing torrent tearing through a gorge less than 20 feet wide and at the head of the gorge was a hanging glacier from under which the milky torrent roared into life. There was a 50 foot waterfall right at the head of the glacier. It was an incrdible sight. We got up and headed up the steep mountain to the true left of the glacier and headed dead south straight towards the huge mountain representing the Pir Panjal’s intimidating might. The terrain turned from meadows to boulders and glacier moraine and the going was slow and tiring. The effort was more than compensated by the tremendous sense of awe I felt at looking around me. I could see the snow and ice across the chandra valley and the highest peak in the CB group, Mulkila, far to the north east. To the south, towering above my head was a beautiful giant mountain with glaciers hanging off it and waterfalls falling but never reaching the ice below. The long, serpentine glacier snaked below me as I walked on its lateral moraine. I felt like I had penetrated to the sacred heart of the Pir Panjals, which technically, I had. After a short rest we decided to cross the glacier and we had to head west at the top, and walk along its eastern bank. 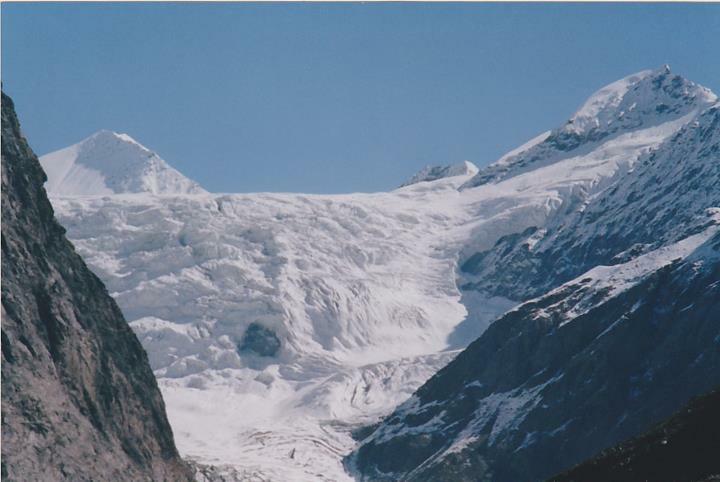 The glacier was filled with gaping crevasses and was covered with fallen boulders and fresh snow. We trudged carefully together and crossed it without incident in half an hour. The nervous energy gave way to euphoria and we glided up on a cloud of exhuberance. Soon walking on fresh snow and moraine sapped our morale and we were eagerly looking out for the lake beyond the next ridge…the next ridge..the next ridge…the ridges were conspiring to multiply against us. The wind was fierce and biting cold. It seared my throat as it went down through my gasping mouth. I balance on the sheet of ice forming below me, as I run through a white world of snow and sleet, breathing the stark beauty I love, aware that I cannot stop for pause here, now. Finally I saw the pile of rocks signifying a gaddi camp. 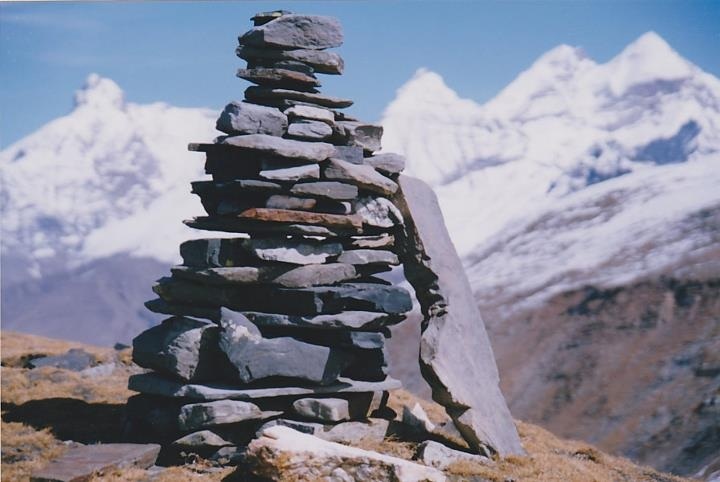 A solitary cairn of stones stood surrounded by snow and beyond it was a depression. The depression was surrounded on three sides by peaks and ridges and the only outlet was along the glacial nala that we had followed up. That HAD to be the lake. I dropped my rucksack and ran towards the unseen depression. what I saw shocked me completely. THERE WAS NO LAKE..!! The snow melted off the amphiteatre of ridges and flowed down into the nala. There was no lake. We had endured the day with the thought of reaching a heavenly lake at the end of the day. Gurgle..Gurgle….grrrr…..bbbrrrr….gurgle….I woke up to find my stomach making strange noises…must have been the bacon…it didnt taste right..toilet paper time..!! As soon as I unzipped my tent and poked my head out, I was mesmerised. The moon was exactly half but the light that emanated, reminded me of one of those sci-fi movies where the aliens descend from shining space saucers. It was such a magical night. The stars were shining bright and clear againt pitch black velvet. And the moon was intoxicating. Gurgle..Gurgle….grrrr…..bbbrrrr….gurgle….yeah right..!! After attending to matters a little less romantic I stared around me in a trance. The snow peaks were shining like huge goblins and I was in love with the world. I thought about waking up Vikram and asking him to bring out his tripod and taking a night shot, but I was afraid his reaction might be less than friendly. I retreated back to bed and was soon in blissful dreamland, dreaming of back-lit fairies and snow flakes falling in slow-motion. We climbed the ridge, something to my far right reflected the sun that was not snow. I looked. I could not believe it. it could not be. Yet, indeed it was the crystal waters of Dashaur lake. Oh my god, we had been 1 hour walk away from the lake and had not known it.The lake was absolutely beautiful. 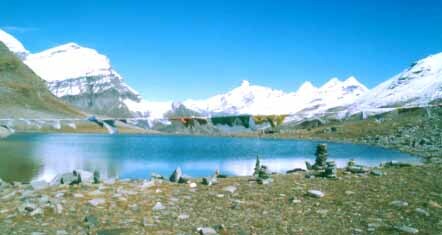 A small glacial lake surrounded by cairns that devout Buddhists and Hindus had placed as offerings in prayer. 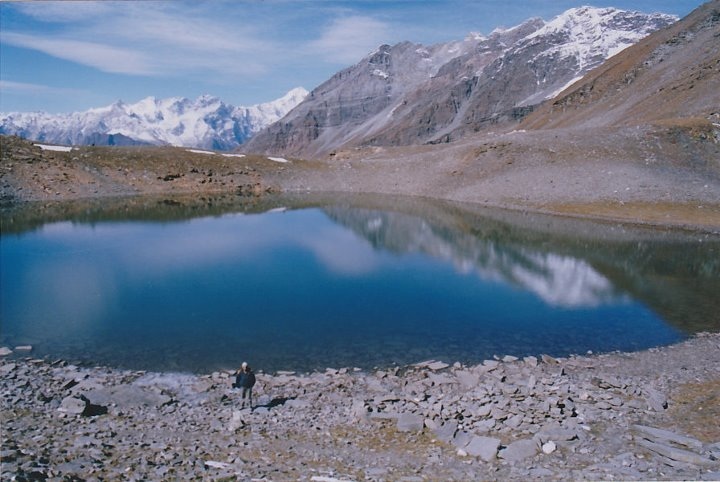 The lake is situated on a pass in the Pir Panjals and is over 4200 m high. To the south, the views encompassed ridge after ridge of mountains down to Kullu. Hanuman Tibba looked like I could touch it. Far, far below was the green oasis of Marhi. 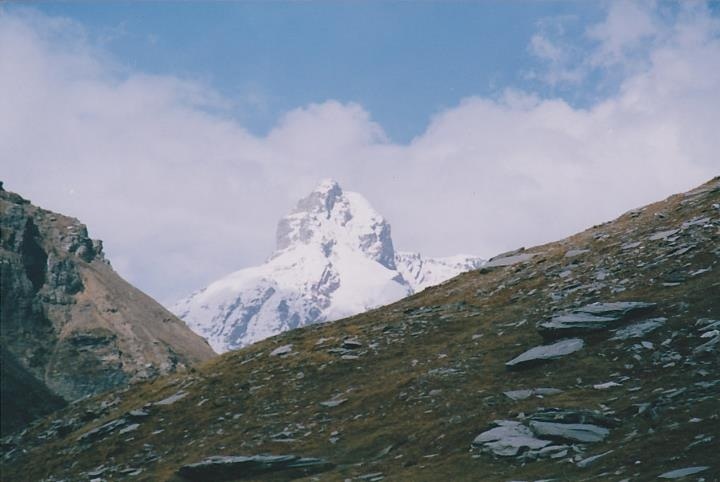 To the north, the vertical peak of Geopang Goh dominated along with three peaks that looked exactly like a manifestation of Bhole Nath’s trishul. It was a heavenly setting. It is one of the most powerfully beautiful places I have ever been to. I knelt before the lake and prayed to this earthly abode of god. I drank the sweet water of the lake and felt blessed to have been allowed to view and feel the divine power of this place. Strange is his leela indeed…when you are seeking, he hides his treasures behind invisible situations, and when you have given up hope and are making your way home, he opens his heart and shows you his secrets. We set out for civilization feeling content and blessed. The drop from Dashaur to Marhi is steep and we descended cautiously breaking icicles off rocks and crunching on them. A little above Marhi, we stopped to see the thousands of tourists crawling up to Rohtang in uncountable sumos and jeeps, belching huge clouds of black smoke and throwing biscuit wrappers into the pristine green. I did not feel sad, nor angry, I did not feel superior, nor right. I just felt in love with life…I just felt in touch with Dashaur, the mystical magic lake. Harpreet Dhillon has been an impassioned rock climbing enthusiast and biker. Spirited adventure of many kinds and a tongue-in-check humour mix readily with a deep sense of reverence for the Himalayas and all that goes with it.